To avoid this issue, he was discharging one battery, then switching over to the other – charging them separately then going through the entire process again. There are a number of things wrong with this approach … but let’s just focus on the reason he was doing this. 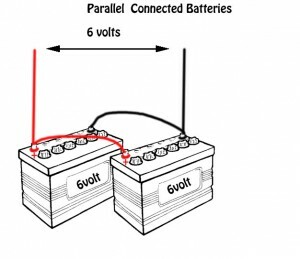 This concept of one battery discharging the other was unknown to me so I started doing some research to see if their behaviour is real or just another motorhome/caravan myth. In this arrangement the positive of one battery is connected to the negative of the next. 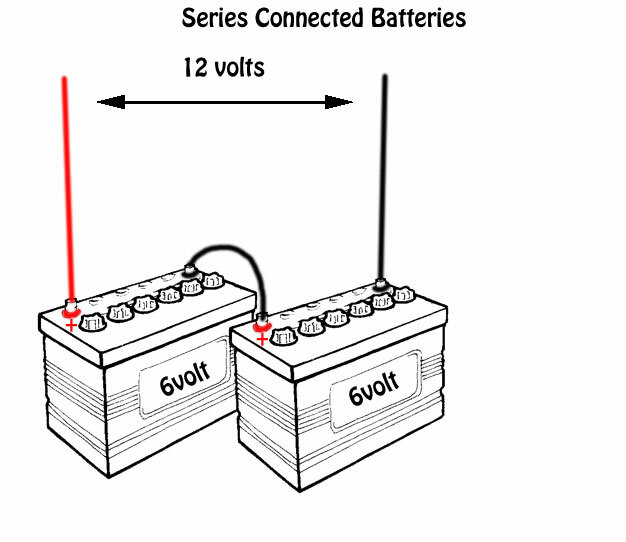 Each battery connected in series adds its VOLTAGE to the system. Two 12 volts batteries in SERIES will give you 24 volts. Four 6 volt batteries in series will also give you 24 volts. Series connecting does NOT increase the amp/hour capacity of the system. Two 100ah batteries connected in series will still equal 100ah – two hundred 100ah batteries connected in series is still 100ah. In a series connected battery bank, every battery will discharge and charge at the same rate – it has to! The electrons flowing into or out of the system must flow through each battery. However, if an imbalance does occur, it will not resolve itself as the MOST charged battery will always stop the charging process (by raising its internal resistance). This is why it is never a good idea to tap 12 volts from the centre of a 24v series pair. This setup has the positive of each battery connected together and the negative of each battery connected together. This has no effect on the system voltage. 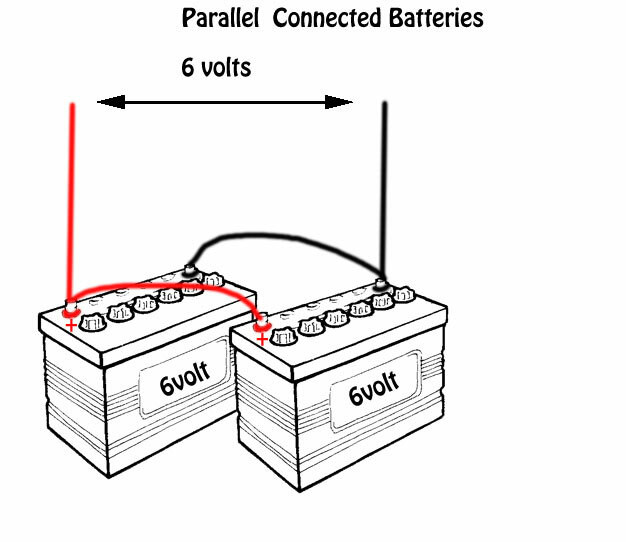 Two 12v batteries connected in parallel is still 12v – two hundred 12v batteries connected in parallel is still 12v. What does increase is the total amp/hour capacity. Two 100ah batteries connected in parallel is 200ah. In a parallel connected battery bank each battery takes all the charge it needs – it and only it decides when it is full and stops accepting charge. Ok – so which is best … series or parallel? It seems that the parallel camp has had a bit of bad press – lots of stories involving self-discharging and dead cells. I could not find any research that backed this up. From all that I could find it seems that most research and indeed the battery manufacturers themselves suggest that batteries in parallel will last longer than the same batteries connected in series. So, what about this “one battery dragging the other down” issue? Well the self-discharge rate for an AGM battery is about 5% per month. That is just 0.16% per day (in reality it is not linear process – but let’s keep it simple). This tiny self-discharge can be ignored by anybody who is using the batteries daily or even weekly. If you plan on storing the system you should take into consideration this self-discharge and be sure to keep a trickle charger on the batteries or at the very least, charge them fully once each month. In most cases the connection method will be determined by the number of batteries required, physical size of each battery and the system voltage. In very large systems a combination of series and parallel will be required to get the voltage and capacity required. If you have the option, then I would recommend a parallel connection to provide for more even charging and discharging and ultimately longer battery life. While we are squashing rumours, I am often asked if it is better (in a parallel connected system) to take the negative from one battery and the positive from another – (is it is shown in my drawing above). The short answer to this is that it makes absolutely no difference. Because of the size of the connecting cables (typically very large) they have close to no resistance and no voltage drop. It therefore does not matter which terminal you charge and discharge from in the slightest. One other very important point (thanks Alan) is that in all cases the batteries must be of the same capacity and chemistry (ie never mix gel,AGM or flooded) – preferably the same age and from the same manufacturer. Failure to follow this rule will destroy batteries very quickly. Just a reminder – I happily answer all questions (relating to caravan and motorhome electrics) posted on the site or by email. I also offer a design and consultancy service to people building or renovating their own motorhomes or caravans. Please email if you would like to know more. How Charged are my Motorhome/Caravan Batteries? Why are my motorhome / caravan batteries going flat? This entry was posted on Friday, January 13th, 2012 at 6:38 pm	and is filed under Caravan, Electrics, Motorhome, Power, Solar. You can follow any responses to this entry through the RSS 2.0 feed. You can leave a response, or trackback from your own site. In Dec 11 I bought a 21 seater Toyota coaster bus. I had the seats taken out. No money yet to fit it out or travel so it has only done 7 K’s. Hence flat batteries. I am a bit frighten to drive it I have to admit. I have two 12 v batteries that are flat. Could you tell me the best wat to regharge them. I have learnt a lesson & I will drive it if I can get it going. It is a 1998 & is 24 volt. I am starting to think it is all to much for me. I never had 24 volt vehicle before & I keep hitting a brick wall that needs lots of money to fix the problem so I am wondering all the time if I should sell & stay home. I am retired & on my own. I think I bitten of more than I can chew so to speak. I read your page & loved it. How is the slab & have you done more? Looking after motorhome batteries is very important if you are not keen on replacing them every few months. The worst possible thing that you can do you car or motorhome batteries is to flatten them and leave them flat. I suggest that you take them to an auto electrician and ask him to to test and recharge them for you. Most importantly, keep in mind that batteries are just buckets for holding electricity – they do not make electricity! You MUST be sure that you are replacing the power taken out (by fridges etc) at the same rate as you are taking it out. You can do this by getting power from the vehicle alternator (special relays can do this for you – again, talk to the auto electrician) OR from solar panels. You may want to read this article about converting vs buying a motorhome http://hobohome.com/news/?p=169 – I honestly feel that you would be much better looking for a motorhome that has had all the hard work done. Converting a bus (even a small one like a coaster) is a MAJOR job. A few years ago I was talking to a professional converter and his estimates for the costs of converting at that stage started at $10,000 per meter of length. Please let us know how you get on and what you decide to do. yes adding a second battery would help – but only if you have the ability to recharge it fully and quickly. Remember that a battery only stores electricity – it does not make it. hi hobo , could ya just get a 24v trickle charger to keep the bus batterys chargerd up when parked up ? Yes that would work fine – a small solar setup would do the same job of course. lower floor,etc, all water up and running but now the technical stuff. A+ to B- & C+ to D- then A- to C- & B+ to D+ (phew got there) and use A- for earth & B+ for positive. enough to run things. Keep refering to your site for idea’s. The trick with series parallel set-ups is do the series part first…. 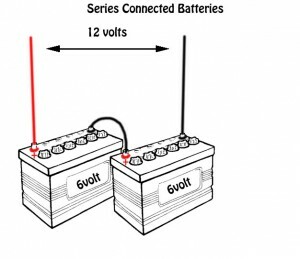 Firstly take two batteries (lets call them A and B) – connect these in series (positive to negative) – you should now think of these two batteries as one battery with double the voltage (ignore the terminals that connect the two – it is just the + and – with nothing connected that we have to worry about) . Now – put these batteries aside – take batteries C and D and do the same (positive to negative). Again, think of this set as one 24v battery. You now have two sets (AB and CD) – Connect the positive terminal of the AB set to the positive terminal of the CD set (either of these positives can be the BANK positive). Connect the negative of the AB set to the negative of the CD set (either of these negative terminals can be the BANK negative) and there you have it. You should now have a 24v bank with twice the amp/hour rating of the individual batteries. I feel that the 2 X 195w panels will struggle to keep up with the requirements of the fridge – especially during the NZ winter months. Panels in Aus are about $1/watt – so another $400 worth of panels would be money well spent. Thanks for that, I will add some panels panels , will let you know what I end up with. From a purist point of view, we always like to see only batteries of the same type, size, chemistry and age connected together in a bank. This is of course not always practical. Your case is a good example of this. I would suggest that it is quite important that the battery types and chemistries are the same (ie don’t mix flooded, Gel and AGM batteries n the same bank). Age is a factor, but an eight month old battery connected to a new one should be fine. Hi Gavin. We bought our 2nd hand caravan a few months ago and it has a 110AH wet battery with 80 watt solar panel and a 7amp controller. During our first trip after a couple of dull days we found that the battery was not holding out so good and the water pump caused the LED lights to flicker. We have not had the battery tested yet but as a backup we purchased a new AGM 120AH Redback Extreme battery. We are also running a 50 litre Bushman fridge from a 110 AH Thumper Extreme battery which has a separate solar panel (160 watt) topping that up. The house fridge is running on gas. Now we know that we cannot connect the two types of battery and expect them to last but is there a way that we can use them to gain the best advantage? Maybe with a changeover switch or something. We really enjoy reading your views on what we need to learn before we embark on longer trips. Firstly get the older battery tested (properly by someone who know what they are doing). With out knowing exactly what is running from the battery and for how long it is difficult to know weather your 80w panel can be expected to keep up with the demand. I suggest getting someone to work this out for you. If it is not, it will quickly destroy the new battery. Solar panels are now very cheap (about $1 / watt) so I would recommend adding additional panels to your system and running the fridge from the same system. I think the Thumper battery is an AGM and thus could be added to your new van battery. It is always better to have a single system that powers everything. I really don’t think it is worth trying to combine the old battery with the new system. I have just read, and enjoyed, your article about the different ways of joining batteries. I had just about decided that parallel was the way for me when I read the last paragraph stating that the batteries must be of the same capacity, EG, 100 ah + 100ah not 100ah + 120 ah. Is this true? A better way of putting it is that “the ideal situation is where all batteries are the same capacity, age and type” – in reality mixing battery capacities will work, it just may shorten the life of one or both batteries. I must confess to not having a lot of experience with “floating” solar power systems – but from what you describe it sounds very close to what I would recommend. High voltage (series connected) panel arrays are the way to go, just look closely at the conversion efficiency of the regulator when the input voltage is as high as 160v – the losses are often quite high when the input voltage is above 2 times the battery voltage. I have not used either of the major components so can’t comment on these. As for grounding, it would be best to consult a marine tech to discuss electrolysis issues. My gut feeling is to ground everything at multiple points all around the boat by running large earth wires back to a common point. While the project does not really fit, I would love to see details and photos (particularly of the electrical system) in our “Other Rigs” section of this website. Hi, i have a caravan system that is dedicated 12v only. i currently have a 110 amp hour deep cycle battery with a 95w solar panel connected permanently with a charge controller. i am looking to possible add a 90lt compressor fridge to the system instead of a 3 way fridge. so i thought i will most likely need another battery in the system. i am going to add in parallel obviously but does it matter if i add a larger battery to the circuit? ie; a 135 amp hour battery? as long as it is also a deep cycle battery it would be ok? It is always best to use batteries of exactly the same type, size and age – that said, other than potentially shortening the life of the batteries, no damage will be done by using a larger battery. Hi, great report. What’s the point in these batteries that are 2v 500ah ratings? I’d need 6 of them in series to get at least 12v but the ah stays the same, I may aswell use 6X 12v 100ah batteries? And get more ah rating. Do these new 2v and 6v batteries last longer than 12v? Series 6X2v 500ah = 12v 500ah but parallel 3X12v 220ah =12v 660ah. The big issue comes when the battery AH capacity gets large. A 500ah 12v battery is typically very difficult to handle – they are simply too big and too heavy. A 12v battery is simply 6 X 2volt batteries inside the same case (that is why you have separate vents and separate inspection/watering ports for each cell (battery)). The two volt batteries are just a 12v battery split into 6 separate cases. Other than handling, the only other advantage of lower cell-count batteries is the greater external surface area. The allows the battery to stay cooler. For every 10 degrees of average temperature increase you reduce the battery life by half (within certain limits).